Since its debut at the Lillehammer 1994 Winter Games, the Paralympic version of ice hockey has quickly become one of the largest attractions for spectators. It is fast-paced, highly physical and played by male athletes with a physical disability in the lower part of the body. 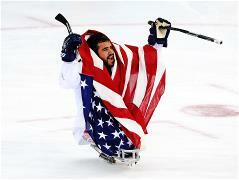 The sport is governed by the IPC with coordination by the IPC Ice Hockey Technical Committee. As in ice hockey, each team attempts to outscore its opponent by shooting the puck across the ice and into the opposing team’s goal while preventing the opposing team from scoring. Six players (including the goalkeeper) from each team are on the ice at one time. Protective Gear: Because of the physical nature of the game, all players are required to wear a helmet with a full cage or mask as well as a protective collar or bib. Players are also encouraged to wear protective padding, including shoulder pads, shin guards, elbow pads and large padded gloves. In addition, the goalkeeper wears leg pads, body pads, a helmet with a visor and a catcher glove to protect the athlete from pucks flying up to 100 km/h. Sledge: Made of aluminium or steel, sledges are 0.6m to 1.2m in length with a curved front end and one or two different seating systems. The sledge is set on two blades, which are usually made of tempered steel and are each 3mm thick. The puck must be able to pass underneath the sledge. The height of the main frame must be between 8.5cm to 9.5cm above the ice, and the length of the blade may not be more than one-third of the total length of the sledge. The sledge may be equipped with a backrest, but it must not protrude laterally beyond the armpits when the player is properly seated. Straps secure a player’s feet, ankles, knees and hips to the sledge. The goaltender may have an additional pick at the base end of his stick. The goaltender may also use an additional stick with a blade or a trapper glove with teeth. A direct descendant of ice hockey, ice sledge hockey was invented at a rehabilitation center in Stockholm, Sweden, during the early 1960s by a group of Swedes who, despite their physical impairment, wanted to continue playing hockey. The men modified a metal frame sled, or sledge, with two regular-sized ice hockey skate blades that allowed the puck to pass underneath. Using round poles with bike handles for sticks, the men played without any goaltenders on a lake south of Stockholm. That same year, Stockholm hosted the first international ice sledge hockey match between a local club team and one from Oslo, Norway. During the 1970s, teams from these two countries played once or twice a year. Several other countries began to establish teams, including Great Britain (1981), Canada (1982), USA (1990), Estonia and Japan (1993). Ice sledge hockey did not become an official event until the Lillehammer 1994 Paralympic Winter Games. Each player in ice sledge hockey uses two sticks that have at one end a metal cap with teeth to maneuver on the ice, and the other part is curved like a regular hockey stick and is used to strike the puck. Ice sledge hockey originated in Sweden and Sweden won the first gold in Paralympic ice sledge hockey in Lillehammer in 1994. Instead of skates, players use sledges with two runners, allowing the puck to slip under them.